Updated: the Nvidia share beta is available now for desktop and it requires downloading the beta version of GeForce experience. Most desktop PCs and laptops should be able to take advantage of the new features so long as they have at least a Nvidia GeForce GTX 650 or GTX 660M chip along with a low-powered Intel Core i3 processor and 4GB of memory. Taking a page out of the Sony handbook, Nvidia has added streaming and sharing features to its GeForce Experience app. While PC's don't come with an instant share button like the PS4 (unless otherwise assigned to a hotkey), Maxwell GPU owners will be able to launch a new overlay to quickly access Nvidia's new sharing features. 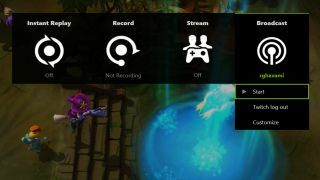 Among the new options, users can use instant replay to record the short bursts of gameplay for a quick instant upload to Twitch, YouTube and another PC using the Share feature. Like on the PS4 or Xbox One, the recording feature switched on at all times to continuously record up to the last 20 minutes of gameplay. What's more, Nvidia's solution gives you a ton more options to pick the quality your footage and full-fledged editing options to trim your saved clips or longer let's plays. On top of uploading gameplay vids, Share also adds a streaming option for any rig powered by an Nvidia GPU. Rather than relying on Ustream or Twitch, starting a broadcast through Share will produce a sharable link that opens a web client in Chrome. In an interesting wrinkle, livestreamers will also be able to pass the controller to their friend or join in two player co-op in case they run into a tough boss or can't get over a hump on their own. Users can virtually pass the controller to anyone even if their laptop or PC does not utilize a Nvidia graphics card since everything is streaming through the Chrome browser. In case this sounds at all familiar, Sony introduced its own game sharing feature on the PS4 in October 2014 called Share Play. Packed into the console's first firmware update, this feature allowed PlayStation players invite a visitor to view your screen and jump into the game themselves for up to 60 minutes. Nvidia plans to roll out the new Share features as the early access beta soon. Following that the GPU maker will release a full updated release later this September. Aside from the new software features for its GeForce Experience app, Nvidia also introduced a new GeForce GTX 950 graphics card. The new GPU pretty much sits at the entry level of Nvidia's line up but it still offers decent performance allowing gamers to play Witcher 3 at 60 fps. Nvidia is also making a big dig at the DoTA 2 playerbase with the GTX 950, promising it will help reduce latency. The GPU maker explained it was able to do this thanks the higher performance of its latest Maxwell card along with removing DX2 from the rendering process and lowering the pre-rendered limit. Effectively this will make MoBA players feel like their game is running smoother with a reduced latency and stutter. Nvidia is also making it easy for users to access these low latency settings by adding a new option to the GeForce Experience graphics tuner. For example the app will auto tune DoTA 2 by reducing the number of maximum pre-rendered frames to one while turning off Nvidia's Multi-Frame sampled anti-aliasing and vertical sync. Of course, it might be easy to reduce input lag, but the ultimate factor when it comes to online gaming is your Internet connection and who is playing host for the match. Out of the box Nvidia promises the GeForce GTX 950 will deliver three times the performance compared to the older generation GeForce GTX 650. The new GPU comes packing 2GB of GDDR5 memory and 768 CUDA cores, and its available starting now for $159 (about £101, AU$216).